Digital Guardian stops ransomware and other external threats by automatically detecting and blocking advanced threats across the entire attack lifecycle. Cybercriminals have turned to ransomware as the latest go-to tool for attacking and extorting businesses using a wide range of variants such as WannaCry, Cryptowall, Samas, Locky, and TeslaCrypt. The recent outbreak of WannaCry was one of the largest and worst ransomware campaigns ever. Traditional signature-based antivirus and threat detection methods have proven to be woefully ineffective against such attacks. Digital Guardian threat detection and response software provides comprehensive protection against advanced cyberattacks - including ransomware. 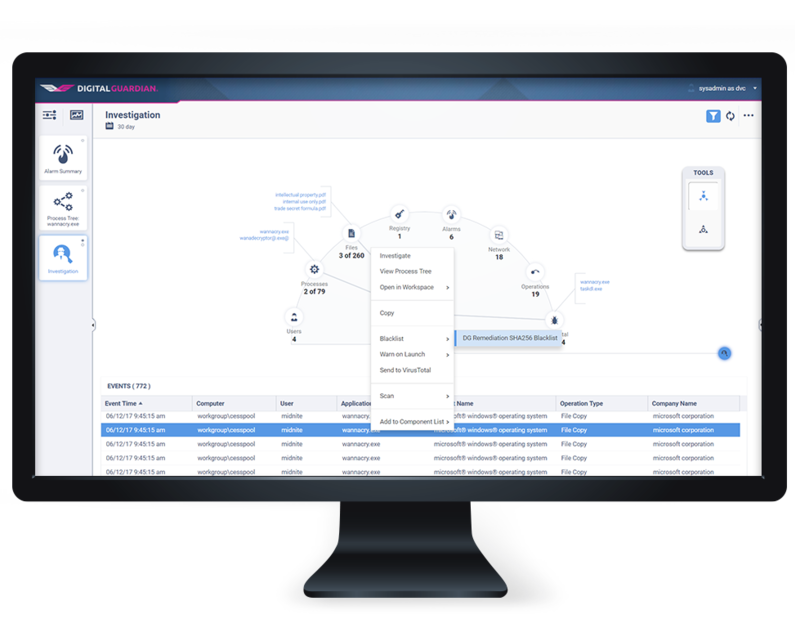 It detects and blocks advanced threats across the entire attack lifecycle. Our threat detection and response capabilities successfully detected and contained the WannaCry attack for ALL our advanced threat protection customers. Digital Guardian starts blocking at the attack’s initial entrance vector (e.g. phishing) and keeps blocking across the entire attack lifecycle including exploit installation/execution and the command and control phase. Only Digital Guardian gives you visibility into system, user and data events with one technology. This combination give you the needed context of data movements to enable faster and more accurate determination of the attack and its motivation, while validating the impact the attack had on your data. Security teams today are overwhelmed with alerts from ineffective products that lack any context or prioritization of attacks; so they end up missing the real threats targeting their data. Our Analytics and Reporting Cloud quickly filters through potential anomalies and only triggers alarms for the high fidelity events that warrant additional investigation. Digital Guardian behavior-based rules can automatically detect and block multiple sources of attacks - ransomware, malware, malware-free attacks and other suspicious data movements. It stops threats even if there are no IOC signatures. Our agent prevents WannaCry from running. Learn how we released a free content pack for all our customers to help protect against the ransomware. See how Digital Guardian can find and stop the threats no one else can.